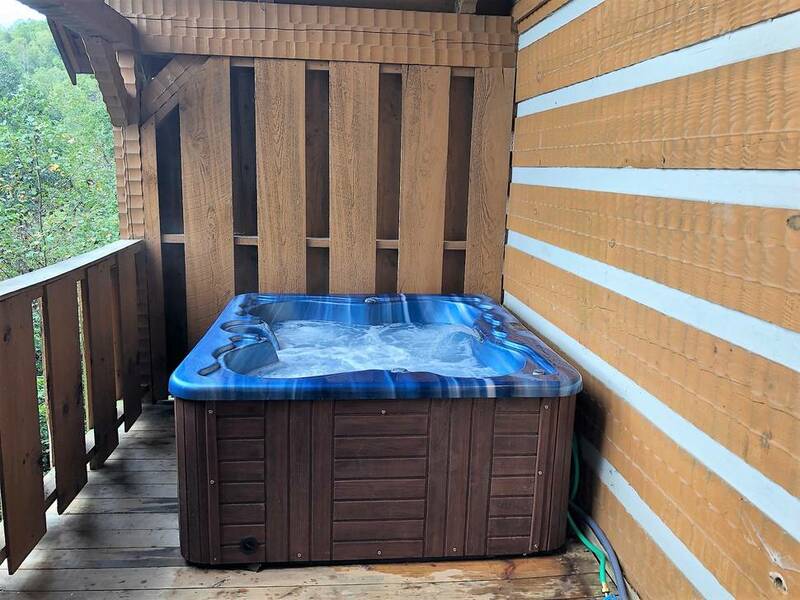 Come and check out this newly renovated log cabin located in the Timberwinds Resort. A View for Two has been outfitted with the couple in mind. From the Rockers on the covered deck to the gas fireplace, A View for Two offers romance and respite from the daily hustle & bustle. The king size bed is comfy with a plush mattress and lots of extra pillows. Cooking is a dream in our fully equipped kitchen with brand new appliances and cooking utensils. You will find all of the conveniences of home whether you want to whip up breakfast or make that once in a lifetime gourmet meal. 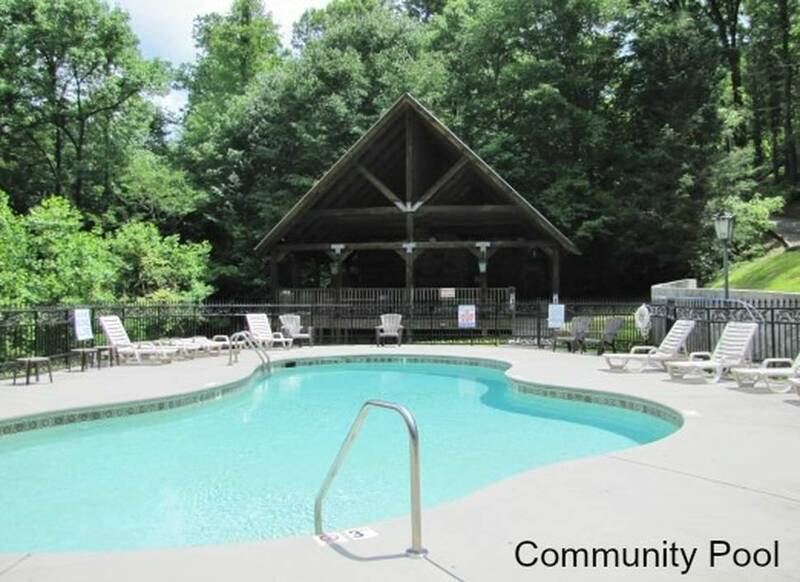 A View for Two is located in the Timberwinds Resort which has a seasonal swimming pool and pavilion for use only by our residents and guest. It is open from sun up to sun down and as long as the water is warm enough to swim. 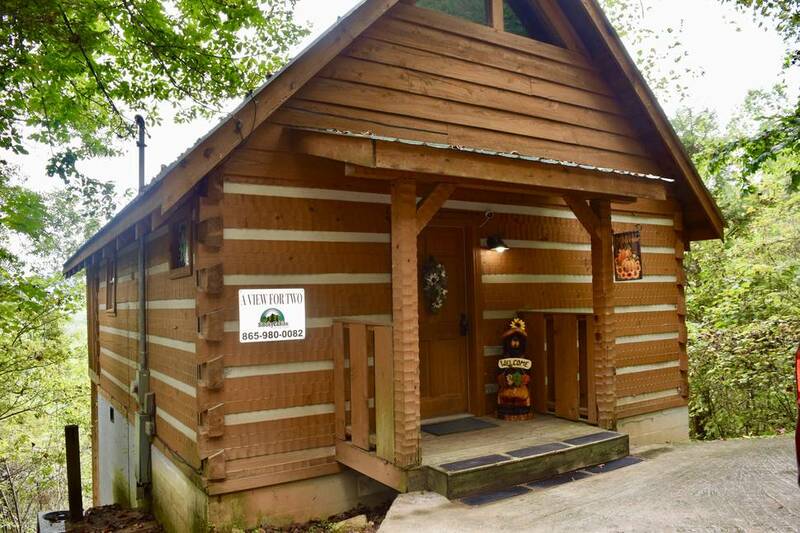 For your convenience and enjoyment, this cabin has Comcast cable and free wifi. We also have a smart TV with Netflix for you to use while you are staying with us. 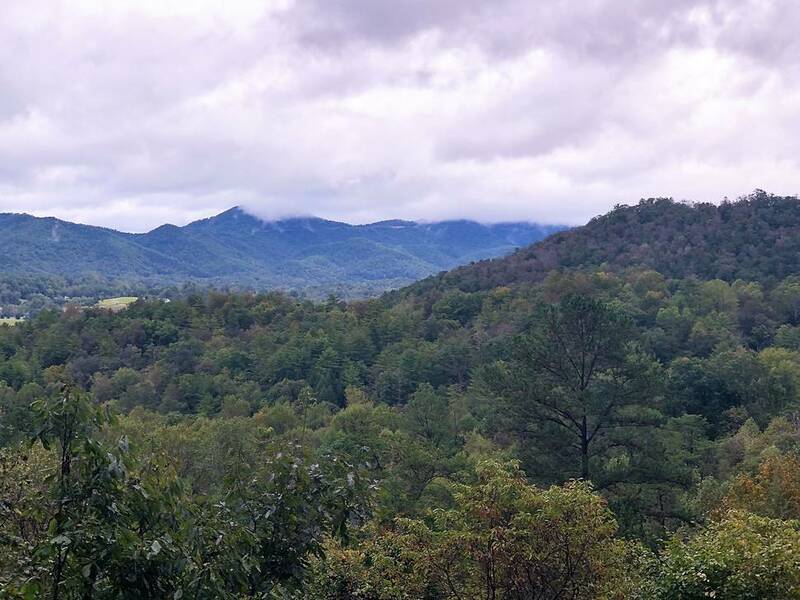 A View for Two is located in Townsend TN just outside of the Great Smoky Mountains National Park. It is about 20 minutes from Pigeon Forge and another 10-15 minutes from Gatlinburg. 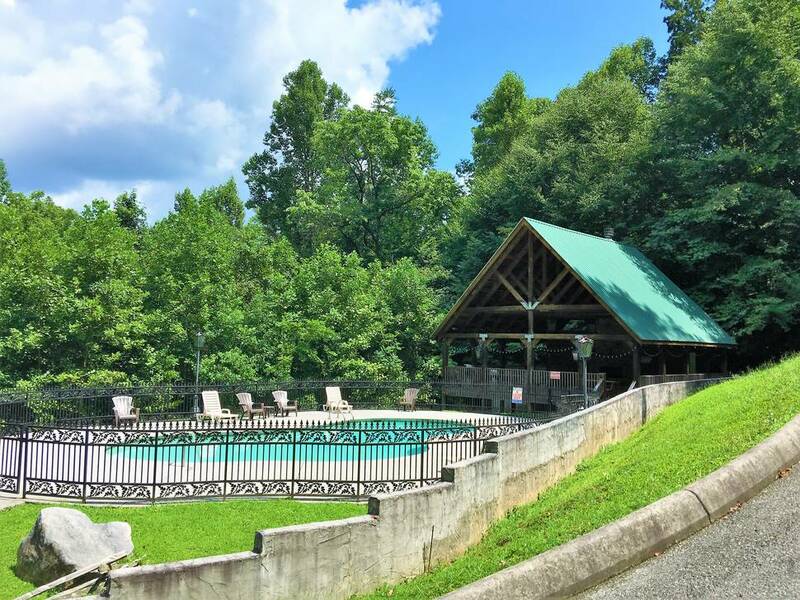 You will find lots to do like zip lining, horseback riding, sight seeing, river tubing and much much more just minutes from the cabin. This cabin has a steep road leading up to it which may require a 4 wheel drive vehicle in ice or snow. A view for two was an amazing cabin! My husband and I stayed here for our 16th anniversary and it was wonderful. 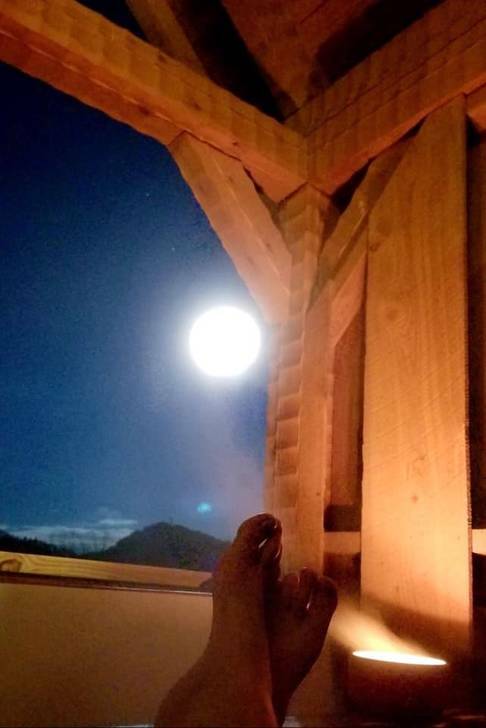 I could have stayed in the hot tub for hours just enjoying the view. Curling up in front of the fireplace and reading books or watching movies was another great way for us to relax. The blankets provided were sooooo soft! The appliances were all brand new and kitchen had plenty of dishes and some cooking essentials. The rainfall shower was a great way to refresh after exploring nature all day. We were also able to enjoy hiking and biking that was close by. We can't wait to hopefully return again. 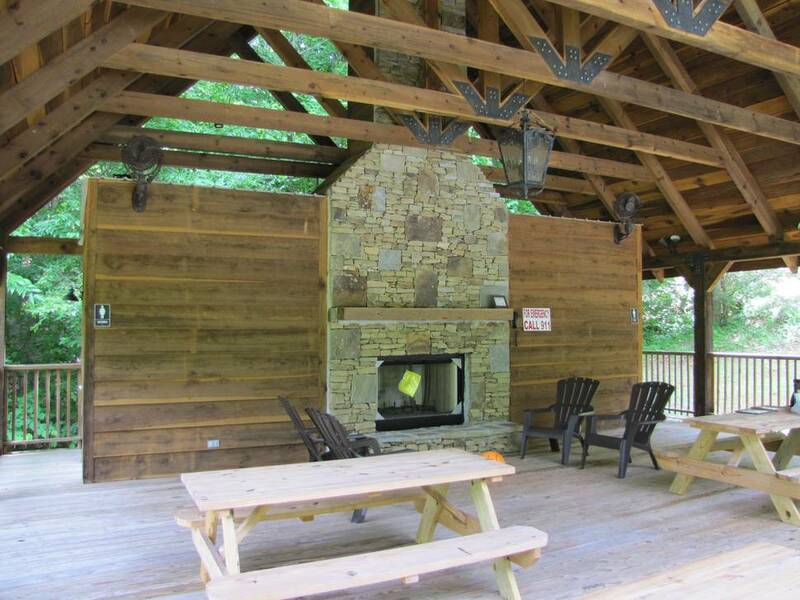 Beautiful location and great cabin with all the amenities we needed. Such a nice, intimate cabin for two! We were so comfortable in this cabin. They have done an excellent job thinking of every detail for a nice stay. The little touches are some homey and well appreciated. For instance, nice soft comfortable throws for you to enjoy while watching a movie by the fire on Netflix. A nice bench at the end of the bed to put on your boots for a long hike. A jewelry holder for the ladies to place their earrings and bracelets on the nightstand. A tray full of bath bombs to use in the in-room whirlpool surely is an extra luxury touch and much welcome after a day spent at Cades Cove. Nice separate shower for the morning shower people (so not me.) Nice Kitchen with all the bells and whistles you need if you wanted to cook dinner or breakfast. Appliances were all new, the dishwasher is very quiet as not to disrupt your binge-watching. Beautiful windows with plenty of light. We saw the most amazing sunrise while there. It woke us both up and it was breathtaking. Other cabins are close by but there is a sincere sense of privacy in this cabin. I hope everyone who might stay here in the future will take care of this little jewel. Restaurants are nearby. We didn't have a 4 wheel drive and we were fine in our truck, but, no frost while there. So happy we made reservations, while it was being remodeled. We took a chance and Ms. Moore at the Smokycabins.com did not steer us wrong. She said "you will not be disappointed and we were NOT. It was a beautiful stay and we hope to return and stay longer. 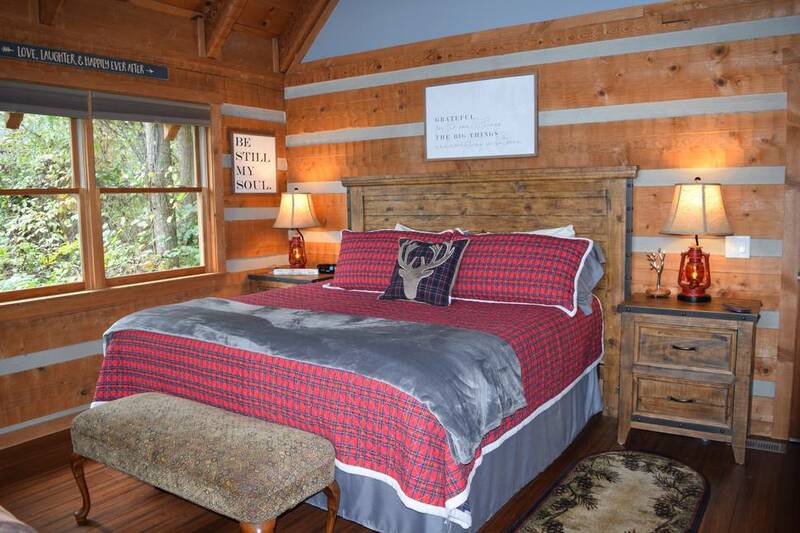 Beautiful cabin... we will make it a point to book this exact same cabin in the future! Very clean... stunning patio view... everything we needed and more for a romantic Christmas getaway! Management was easy to get in contact with! Beautiful new renovated cabin with a spectacular view from the rocking chairs on the back porch. Cabin is well stocked with all the essentials. Bed & pillows very comfortable. Wireless internet works great. Great space with a ton of charm. It was perfect for 2 people and will hopefully return soon! We absolutely LOVED our 2-night stay! We had stayed in this cabin 3 times previously, under a different management company, and were so impressed with the recent renovations! We thought the cabin was great before and it’s unbeatable now! The PRIVACY and quiet are perfect for a romantic getaway and the entire “studio” layout is excellent aesthetically & efficiency-wise. It’s clean, & spacious, with a LOVELY new bathroom and gorgeous new kitchen. Some of our favorite changes were the hardwood floors (much cleaner than the old carpet) and the improvements to the deck rail so you can thoroughly enjoy the view even while down inside the hot tub. We usually stay in the spring, and this was our first time in winter. Even at 17 degrees outside you can sit in that tub and “soak in” the scenery! I also love the fact that the kitchen is fully stocked and the price is lower than anything comparable. SO WORTH THE MONEY. I recommend this cabin to literally everyone I know :) PS: in addition to Netflix, this cabin also has a BluRay player. Cozy movie time in front of the fire! A beautiful, cozy cabin with a breathtaking view!! The cabin was very clean and beautiful but the view was amazing. We were so pleased with our stay. The cabin had everything you could ask for. We will definitely be back. Very nice cabin for a weekend getaway, The recent update was top notch! Views were great and although cabins were nearby it felt very private. The road to the cabin was very steep and narrow but I was expecting that from the cabin description. Would definitely stay at this cabin again. This cabin took our #1 spot by far! From the view to the decor, this cabin was everything we hoped for this trip and more! The small touches far exceeded our expectations. 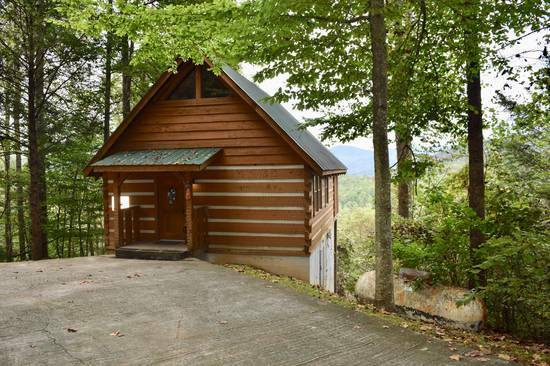 Note to someone renting this cabin: Be aware that if your tires aren't brand new and it has rained, the traction can be difficult when heading up. 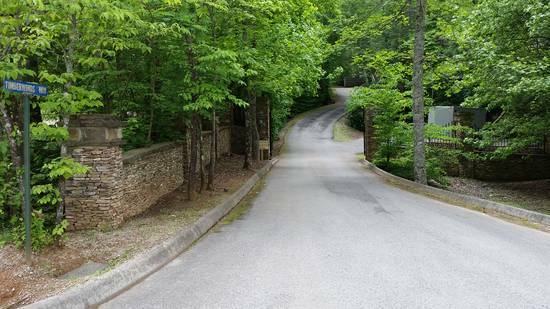 Just utilize the other cabin driveways to get a head start lead. We will definitely be back to this cabin and cannot wait to book our next trip! The cabin was really nice and the views were amazing. As others have said lots of thoughtful little touches to make the stay more enjoyable. It’s a little out of the way so if you are looking for something “close to the action “ this is not your place. Hard to beat this for a quiet romantic getaway. I enjoyed the quaint and warm place! The cabin was absolutely beautiful. The view is stunning! The drive up was very steep, but so worth it.